Good morning stampers! 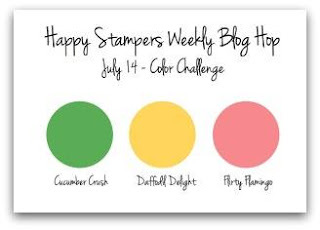 Today, we have a Color Challenge this week with the Happy Stampers blog hop! Use any stamps, your favorite paper, any layout, but use this Color Combo as inspiration! Lovely Stitches By Stampin' Up! 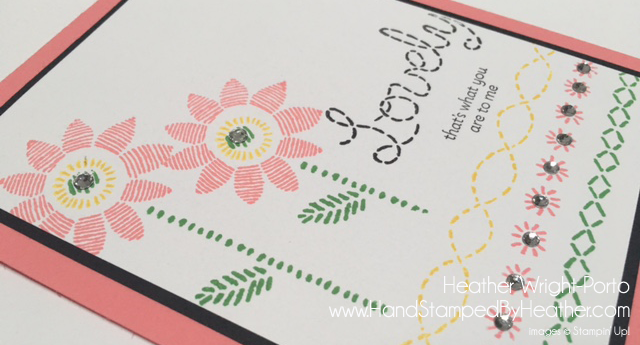 I'm featuring the Lovely Stitches stamp set by Stampin' Up! And you can create this is 10 minutes or less!!! Card instructions and Stampin' Up! Product used below (scroll down). Now it's time to go and see what the rest of the Happy Stampers designers have come up with for this week's challenge. They are super talented and you are sure to enjoy their projects! 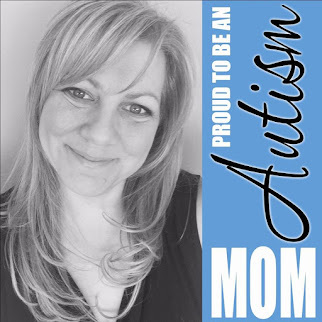 Next on our Happy Stampers hop is Sandi MacIver --- our super talented leader! Card base is Flirty Flamingo. Cut a 3-1/2 x 4-3/4 piece of Whisper White. Stamp the various images in Daffodil Delight, Cucumber Crush, Flirty Flamingo. Greeting is stamped in Basic Black. Mat on Basic Black card stock. Adhere to card base using SNAIL although I'm sure Stampin' Dimensionals would add a little something too! very cute card Heather I have not tried that stamp set yet but you did an absolutely amazing job with it. Darling card Heather, it reminds me of one of those stitched pillowcases that I loved as a child. Love your layout and use of the stamps and colors. Another set I must get!